The design of these two turntables fits perfectly with our growing understanding of the paramount need to control vibration in music systems. The pernicious effects of vibration are nearly always badly understood, unrecognised or even ignored, not just by listeners but, sadly, also by many manufacturers. Its effects are to create out-of-phase spurious signals in microphonic components (most circuit board items!) which then intermodulate, or react, with the music signal to create a hard edge, loss of detail and soundstage and loose, ill-timed bass. Realism and presence suffer to the point where the music loses its drama and interest. 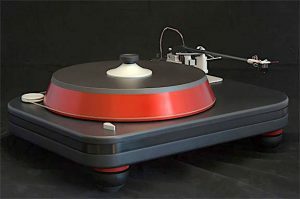 If you accept the concept of vibration damage you’ll realise that designing to control unwanted energy in a turntable, handling the most minute signals, is exceptionally difficult. SpiralGroove use sophisticated computer analysis to model the flow of energy throughout the structures, allowing them to direct and absorb it. Do these turntables have a fault? Yes – for some audiophile they don’t look “techy” enough! Some other turntables can look like oil rigs, but don’t let the simple, uncluttered appearance of the Spiral Grooves fool you – there is a world of original thought and superb engineering under the surface. The SG1.2 and SG2 use multi-layer damping in the plinth and the platter – with the motor, the arm and the bearing all mounted on different layers. 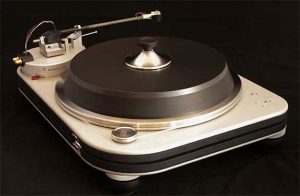 Solid construction ensures that stylus, arm pivot, platter bearing and motor remain in an absolutely fixed relationship, unlike suspended turntables that are perpetually in motion as they try to correct, after the event, for the dynamic forces from airborne energy, the pull of the motor and the changing drag of the stylus as it tracks music. As well as its superior energy damping the SG1.2 also offers a bayonet mount for the arm. This invaluable facility allows for near-instantaneous exchange of arms as a complete assembly, without any need for set-up adjustments, if the user needs alternative cartridges, eg for 78 records. It also makes for very convenient and accurate cartridge mounting. Mounts are available for a number of popular arms, such as the Graham. Best performance from a cartridge is possible only if the arm is easy to set up and offers precise adjustment of all the parameters. This one does. It is a delight compared with the difficulties you encounter with so many otherwise good performers. “…this may be the best tonearm I’ve heard. Its sound is different in ways that will open people’s ears, and I predict that it will affect the design of every tonearm from now on.” – Brian Damkroger, Stereophile. There are versions of the arm for SG turntables and a Universal one, all £5,900.